In this guide, we'll show you how to send SMS and MMS messages in your PHP web application using Twilio's Programmable SMS. The code snippets in this guide target PHP versions 5.x and 7.x and make use of the Twilio PHP Helper Library. Keep an eye on currently supported PHP releases and always use a version which still receives security updates. Already have a Twilio account with a phone number? You're all set - feel free to skip this section. 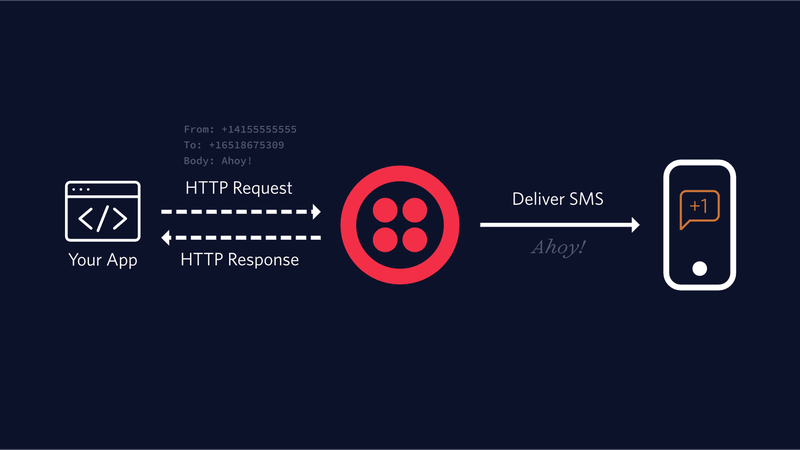 To send an outgoing SMS message from your Twilio account, you’ll need to make an HTTP POST to Twilio's Message resource. Using the Twilio PHP Helper Library, you can create a new instance of the Message resource and specify the To, From, and Body parameters for your message. There are two ways to install the PHP Helper library - which is easier depends on your platform. Replace the placeholder values for sid and token with your unique values for Account SID and Auth Token. You can find these in your Twilio console. Please note: it's okay to hardcode your credentials to test, but use environment variables to keep them secret before deploying to production. Check out how to set environment variables for more information. You’ll tell Twilio which phone number to use to send this message by replacing the from number with the Twilio phone number you purchased earlier. In the line with the // to comment (line 11 in our sample code), put the recipient number (likely your cell phone number). Then you should quickly see a blinking or beeping phone with the SMS - neat! When Twilio receives your request to send an SMS via the REST API, it will check that you’ve included a valid Twilio phone number in the from field. Twilio will then either queue the SMS or return this HTTP error in its response to your request. You can access any of these attributes from your PHP code, much like we did when we printed the sid. Try adding a print statement like print($message->status);. Save the file, then run the code with php send-sms.php one more time. You should see the status of your message, "queued", printed to your terminal. Want to track the status of your messages in real-time? You’ll need to set up a StatusCallback URL. Learn more in our tutorial on confirming message delivery in PHP. in a loop - there is no need for you to add a delay in your logic. You can send as many messages as you’d like as quickly as you can and Twilio will queue them up for delivery at your prescribed rate limit. This will create a new Message instance for each phone number in the list. You may find that it's helpful to organize your account and message logs into separate Messaging Services. See our guide on how to set up and send messages from a messaging service for more tips. To include media in your Twilio-powered text message, you need to make one small addition to the code we wrote above. To send an MMS, you will still make an HTTP POST request to the Message resource but this time specify a parameter for the URL of media, such as an image. Again, update the from and // to commented line to use your Twilio phone number and your mobile phone. The new mediaUrl parameter in this code tells Twilio where to go to fetch our included image. This must be a publicly accessible URL: Twilio will not be able to reach any URLs that are hidden or require authentication. In just a moment you should receive a text message with an image - looks good, right? Want to build more messaging functionality into your PHP Application? Also, try our PHP SMS Quickstart, and see how to receive and reply to messages in PHP.